Canon UK commissioned the research to mark the launch of its 365 Days of Summer competition to find a storyteller to spend a year identifying and living 365 new stories across the globe as part of its new Live For The Story brand positioning. Roald Dahl, the creator of classics such as Charlie and the Chocolate Factory and James and the Giant Peach has topped the poll of the greatest authors, songwriters, artists and photographers. Visual storytellers including graffiti artist Banksy, Jurassic Park director Steven Spielberg and legendary cartoonist Walt Disney also featured in the top 50. The research also showed a staggering 94 per cent of adults enjoy a good story with the average adult telling four stories a day, through words, conversation and with photos. Matthew Searle – Country Director, Canon UK and Ireland said: “You can’t beat a good story, whether it’s words in a book, photographs, film or simply through conversation. Roald Dahl in particular may be well known for his words, but the images which accompanied many of his children’s books have helped to paint a picture for children for generations. Canon is looking for someone to fill a very unique position as it begins its search for the ultimate storyteller. The lucky person will spend a year chasing summer across the globe in order to identify 365 inspiring stories. Applications for this unique role will be taken via Instagram and judged by actress, producer, musician and storyteller, Zoë Kravitz. The successful candidate will chase summer all over the world, visiting destinations from Lisbon to Melbourne to Brazil, curating their own story of the summer. Those who think they have what it takes to inspire people to find their own stories can apply by sharing their most memorable summer story on Instagram with the story behind it (no more than 50 words), tagging @CanonUK and #liveforthestory. Submissions will be judged on a number of elements including storytelling ability, visual appeal, originality and inspirational qualities. The successful candidate will be required to travel the world chasing summer in order to identify 365 inspiring stories throughout the course of the job. The role is all expenses paid and, of course, offers a holiday allowance of 365 days per annum. Canon’s storyteller will be tasked with identifying 365 new summer stories throughout the year, bringing back the art of storytelling and inspiring people to make the most of every moment in their life. The journey they choose is for them to decide, it will be their story to create and inspire. London, UK, 22 July 2016 – Canon Europe will be demonstrating its full range of professional imaging products at IBC 2016, the leading global tradeshow for the media and broadcast industry in Amsterdam, Netherlands. Having exhibited at IBC for more than three decades, Canon will display its latest industry-leading innovations – the range will include professional cameras, broadcast live streaming, reference displays and in excess of 100 lenses. The Canon stand will provide visitors with the opportunity to get hands-on with Canon’s Full HD, 4K and HDR products, through a variety of end-to-end workflow scenarios – from shooting experiences, to review and editing processes, including innovative low-light and long distance live shooting demos. Since its inception in 2011, Canon’s Cinema EOS range has been instrumental in transforming the professional video industry – with a range of innovations, including Dual Pixel CMOS AF for effective autofocus, leading sensor technology and advances in resolution. In April 2016, Canon saw the family of Cinema EOS products expand further with the launch of the versatile ME200S-SH, a compact professional multi-purpose video camera, and CN-E18-80mm T4.4 L IS, a compact cinema EOS lens with cine-servo style functionality. Both will be on display for touch and try, for the first time in Europe. At the show, broadcast and cinematography professionals will be able to get hands-on with Canon’s full range of 4K, Full HD and HDR products including the prestigious Cinema EOS Range, stunning reference display units and broadcast solutions. Visitors can experience the full power of the company’s optics portfolio, with Canon’s extensive range of lenses, from broadcast to cinema and EF lenses. Canon’s IBC stand can be found at Hall 12, stand D60. Wex Photographic is a Canon authorized retailer in Great Britain. United Kingdom, Republic of Ireland, 21 June 2016 – Canon UK, a leader in imaging solutions, today marks the company’s 40th anniversary with a birthday celebration for all 2,000 employees who will also receive an extra day off to celebrate their own birthdays. Canon Business Machines was established in the UK on 21st June 1976 when the key focus was on sales of calculators, micrographic equipment and photocopiers for the business market. In 1982, Canon merged with a separate camera sales operation to create Canon UK, as it is now known, growing to become a leader of digital imaging solutions for office and home environments. When Canon first came to the UK it operated from a house in Croydon but now has offices across the country including the award winning head office in Reigate (Surrey) as well as London, Birmingham, Livingston (Scotland) and Belfast where today’s anniversary will be celebrated. Throughout the period, Canon has continued to evolve and enhance its broad offering to create exciting technologies that continue to push the boundaries of what is possible in the world of imaging, including developments in broadcast, production print, photography and office solutions. When Canon UK was established the latest product was the “AE-1”, the world’s first 35mm AE SLR equipped with a central processing unit (CPU) and seen as a pioneer of automated and computerised cameras. With its strong ongoing investments in R&D, Canon remains a creator of ground breaking new technologies, such as a 250-megapixel CMOS sensor, the world’s highest pixel count for its size. Canon’s ongoing passion for the power of image has extended and grown into new markets such as 3D print and Network Video Solutions ensuring that the demands of customers are met today and into the future. Wex Photographic is an Authorized Retailer of Canon gear in the UK. Canon is reinforcing its commitment to high levels of service with the announcement of a two year warranty on all EOS-1D and Cinema EOS camera bodies, providing photographers and filmmakers with outstanding cover, free of charge. The offer consists of a one-year extension on top of the one-year Standard European Warranty System (EWS), under identical terms and conditions, and is absolutely free of charge. This gives you a total warranty period of two years from date of first purchase. For full details and terms and conditions you can download the warranty leaflet by clicking here. To find out more about Canon Professional Services (CPS) just click here. If you're an existing CPS member you can register your product by clicking here. You can also also register to join the CPS Programme from this link. Wex Photographic carries Canon Cinema EOS camera bodies. United Kingdom, Republic of Ireland, 24th February 2016 – Canon will be back at The Photography Show in March with its biggest, most engaging stand to date. For the first time Canon will be premiering its very own Live Stage, hosting live and insightful talks from world renown, industry leading photographers and videographers. Canon will also be showcasing the recently announced EOS 1D-X Mark II, demonstrating its awesome power and speed along with a host of award winning products. Across the course of the show, Canon’s first ever Live Stage will feature professional Canon photographers including the likes of wildlife photography expert Andy Rouse, leading filmmaker Simeon Quarrie and international photographers Lara Jade and Christian Anderl. They will take visitors on an inspiring journey through their photography experiences and share how Canon products have allowed them to take their passion to a professional level. Experts from Canon’s Professional Services (CPS) team will be on hand throughout the show, offering advice and tips to pros and those looking to take their photography to the next level. Canon’s largest Photography Show stand yet will also be chocked full of brand new products such as the new EOS 80D and the PowerShot G7 X Mark II.Plus visitors will be able to witness Canon’s range of PIXMA and large format printers including the new A2 inkjet printer, the imagePROGRAF PRO-1000. Plus Canon is giving people the chance to be part of its show experience, offering lucky fans on its social media pages the chance to win tickets to the show and have their image displayed on the Canon stand. To find out more visit Canon on Facebook and Twitter. Come and see Canon at The Photography Show from 19th – 22nd March 2016 at Stands D141 and E131. More information on Canon’s complete presence at The Photography Show 2016 can be found here. 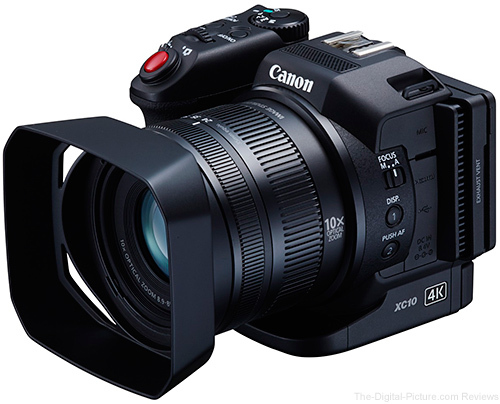 The XC10 joins several of Canon’s high-end professional broadcast cameras in meeting the criteria defined by the European Broadcasting Union, including the Canon XF305, the Canon EOS C300 and the Canon EOS-1DC. The XC10 has impressive low light performance and image quality, which, combined with its compact size and remote controllability, makes it an ideal main or secondary camera in HD broadcast acquisition. B&H carries the Canon XC10 4K Professional Camcorder. United Kingdom, Republic of Ireland, 8 September 2015 – Canon Europe, a leader in imaging solutions, today announces that its parent company, Canon Inc., is developing a Cinema EOS System 8K camera and professional-use 8K reference display that will support the production of next-generation 8K video content, along with a still-image single-lens reflex camera equipped with a CMOS sensor featuring approximately 120 million effective pixels. Through the Company’s proprietary imaging technologies, Canon provides still and video input and output devices that will contribute to the development of imaging culture. Canon, as a leading company in the field of imaging technology, conducts research and development into devices designed to support cinema and video production with the aim of expanding the boundaries of visual expression. Through the further enhancement of the Cinema EOS System 8K camera and professional-use 8K reference display under development, Canon aims to contribute to smooth production workflows, facilitating not only the input and output of 8K video content, but also such processes as 8K to 4K down-conversion and 4K cropping. The Cinema EOS System 8K camera being developed will be equipped with a Canon Super 35 mm-equivalent CMOS sensor that makes possible high-resolution 8,192 x 4,320 pixel (approximately 35.39 million effective pixels) imaging performance even at a frame rate of 60 frames per second with 13 stops of dynamic range and a richly expressive wide colour gamut. Additionally, featuring a body size that realises outstanding mobility and a design that delivers high levels of operability, along with an EF mount that offers compatibility with Canon’s extensive interchangeable EF lens lineup, the camera will support diverse shooting styles and means of visual expression. Incorporating Canon image-processing technology, the ultra-high-resolution 8K reference display currently under development will achieve high brightness, high contrast (high dynamic range) and a wide colour gamut. Additionally, with a pixel density exceeding 300 pixels per inch, a level approaching the limit of human visibility, the display will make possible ultra-realistic imaging that enables the reproduction of subtle changes in light that were previously not possible. Furthermore, when used in combination with the Cinema EOS System 8K camera, the display will be capable of conveying truly impressive levels of visual expression. Featuring a resolution of approximately 120 effective megapixels, the SLR camera now being developed will incorporate a Canon-developed high-pixel-density CMOS sensor within the current EOS-series platform, which will realise compatibility with the Company’s diverse interchangeable EF lens lineup. The high-resolution images that the camera will be capable of producing will recreate the three-dimensional texture, feel and presence of subjects, making them appear as if they are really before one’s eyes. The camera will facilitate a level of resolution that is more than sufficient for enlarged poster-sized printout while also enabling images to be cropped and trimmed without sacrificing image resolution and clarity. United Kingdom, Republic of Ireland, 1 September 2015 – Canon Europe and Getty Images today reveal a series of iconic images which, shot by some of the world's leading photographers, represent defining moments from the past decade and bring to light the power of photography and the role it plays in helping to affect change around the world. Known for enabling people to tell the stories that need to be told, the Canon EOS 5D series celebrates its 10th anniversary with an initiative that showcases 10 amazing images that tell some of these stories. From exposing the use of chemical weapons by the Syrian army, to uncovering illegal logging of rare and endangered trees in Madagascar, the EOS 5D has been the camera of choice for many professional photographers over the past decade and has captured some of the world’s most significant and important moments. To view all the images and the amazing stories behind them, visit Canon’s Showcase within the Come and See website. The images will also be available to view as part of a special anniversary exhibition within Canon’s space during the professional week at Visa pour l’Image 2015, the annual festival of photojournalism held in Perpignan, France, from August 31 to September 6 2015. To further celebrate 10 years of profound imagery, Canon Europe is also launching a pan-European competition that will offer participants the chance to win limited edition EOS 5D anniversary prizes. All photographers, from amateurs to professionals, both smartphone and camera users, are invited to share an image that they feel represents a story of change. Winners will be selected by a panel of award winning judges, including Canon Ambassador Brent Stirton and Getty Images photographer Toby Smith. The Canon Iconic Images competition will run in eighteen European countries (UK, France, Germany, Spain, Netherlands, Belgium, Austria, Norway, Denmark, Finland, Sweden, Switzerland, Portugal, Hungary, Poland, Slovakia, Czech Republic and Russia) from September 1 until October 2 2015. For more information please visit the ‘Iconic Images’ competition page within the Gallery section of Canon’s ‘Come and See’ website. John’s image of a woman weeping at the foot of her husband’s grave depicts a personal moment of change against a backdrop of simultaneously changing attitudes towards the deployment of troops in conflicts overseas such as Iraq and Afghanistan. Published within many of the world’s leading media titles, his image touched the heart of millions and showed the devastating consequences at home of war. Taken whilst on assignment to document the Colombian civil war, Alvaro’s image of two female guerrilla soldiers caught the attention and imagination of the mainstream media, highlighting the long suffering plight of the Columbian people and bringing the reality of this largely forgotten 50-year conflict to the general public. When Veronique de Viguerie and her journalist colleague travelled to Somalia to meet with one of the pirate chiefs it was still an unknown story outside of the region. The resulting report was ground-breaking and was published as the first landmark feature on the subject, just as it was about to enter headlines globally. Toby’s body of work on illegal logging of endangered species of trees in Madagascar became part of the first prosecution on US soil of international traders using endangered species of timber. Ed’s heart-breaking photos of young children armed with powerful weapons were published internationally and later shown in the US Senate which went on to see the US government and UN Security Council apply renewed pressure on the Somali transitional government to stop using child soldiers. Marco Di Lauro partnered with UNICEF UK to document the serious food crisis gripping the West African nation of Niger. His surreal, striking photograph captured the attention of the public by offering something new, a different side to a widely reported issue. The impact of the work helped raise several million dollars in a few months to help the Nigerien people. Port-au-Prince was one of the most severely damaged places in Haiti during the devastating earthquake in 2010. Published internationally, Jonathan’s image raised refreshed awareness about the extraordinarily poor conditions that people were still living in one year on. Permanently guarded by four armed sentries, Brent’s image of one of the last northern white rhinos in the world was captured as part of a wider investigation in to the use of animals in black market medicines. Highlighting the fragility of the rhino’s existence, as the world’s most endangered species, the image reached an audience of millions globally. The series of images, video footage and soil samples which Laurent and a fellow journalist took, were published globally and used by French, British and American administrations as evidence of the use of chemical weapons by the Syrian army. This lead to pressure by world leaders to stop the use of chemical weapons in this conflict. Dan’s image of four Pakistani migrant men arriving on the beach of the Greek Island of Kos from Turkey captures one of the most important stories to have come out of 2015 so far. His work has been published internationally in many influential media outlets, helping to raise awareness of the issue around the world. Check out the special article on CPN to see the 10 iconic images. United Kingdom, Republic of Ireland, 27th August 2015 – As Official Sponsor of Rugby World Cup 2015, Canon is giving customers the chance to win one of 50 pairs of tickets when they buy a selected Canon product. Lucky winners will receive a pair of tickets to attend a Rugby World Cup 2015 match held at one of 13 venues around England and Wales. The offer runs from 20th August 2015 until 31st October 2015 for eligible products purchased from UK or Republic of Ireland retailers. Terms and conditions apply. Amazon.co.uk and Wex Photographic are authorized resellers of Canon equipment in the UK. United Kingdom, Republic of Ireland, 25 August 2015 – Canon today unveils the CJ12ex4.3B, a new 2/3” portable 4K zoom lens with the world’s widest focal length – an incredible 4.3mm, designed for professionals shooting interviews or live broadcast, including sport and news. Canon also today announces that it is developing a new compact 2/3” 4K all-purpose-zoom lens. Further bolstering Canon’s 4K broadcast lens range for cameras employing 2/3” sensors, the versatile new lens will be optimised for both indoor and outdoor shooting, across a variety of applications including, sporting events, live broadcasts, as well as television dramas and commercials. Leveraging Canon’s renowned heritage in optical design and advanced technologies, the CJ12ex4.3B delivers outstanding 4K image quality throughout the entire 12x optical zoom range. Providing the freedom to quickly adapt to different shooting environments, the new lens enables shooters to swiftly move from an ultra-wide 4.3mm angle shot to close ups, whilst ensuring first-class image quality from the very centre to the edge. A built-in 2x extender also helps provides even greater focal reach, whilst still maintaining 4K optical performance. To further provide sharp, high contrast images, the CJ12ex4.3B includes an increased use of fluorite and UD glass combined with Canon’s expert coatings, resulting in exceptional control over ghosting and flare. A new three group internal focus system also reduces focus breathing. Boasting a brand new design, the CJ12ex4.3B is compact and lightweight, weighing just 2.1kg, making it similar in size and weight to a comparable 2/3” HD lens. Ideal for on-shoulder shooting traditionally adopted by news gatherers, the lens can easily be used on-the-go, and with an ergonomic design and grip, it is comfortable to hold for longer periods of time. 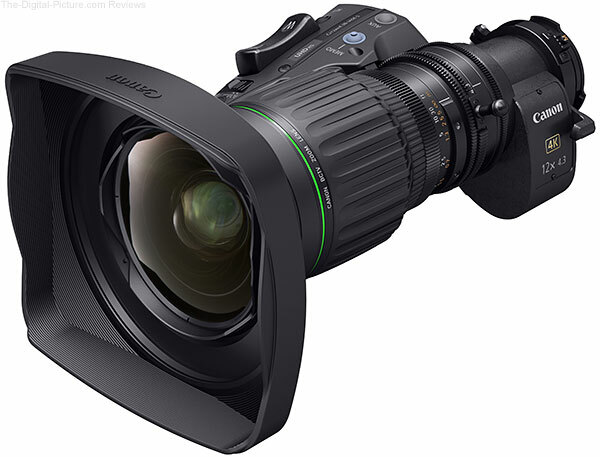 The lens also incorporates three 20-pin connectors for easy integration with existing HD zoom/focus controllers and can be directly connected to an external virtual operation system at the same time. Featuring a Digital Drive Unit, the CJ12ex4.3B offers advanced operability giving users the freedom to select repeatable zoom positions and speeds, in addition to focus and iris settings. A 16-bit absolute value encoder integrated into the Digital Drive Unit allows operators to start shooting with the camera’s aberration compensation function in an instant, without the need for any initialization. This is perfect for news and wildlife environments where action can disappear as quickly as it started. A digital display, built into the Digital Drive Unit, also makes it easy to set, review and adjust vital functions in a way similar to 2/3” HD lenses. United Kingdom, Republic of Ireland, 15 August 2015 – Canon today announces it has received three prestigious awards from the European Imaging and Sound Association (EISA). The EOS 7D Mark II has been named the ‘European Prosumer DSLR Camera 2015-2016’, both the EOS 5DS and 5DS R have been honoured with the title of ‘European Professional DSLR Camera 2015-2016’, while the Canon EF 11-24mm f/4L USM has been awarded ‘European Professional DSLR Lens 2015-2016’ – highlighting the outstanding quality of Canon products throughout its DSLR and lens range. The Canon EOS 7D Mark II is one of the best APS-C DSLRs ever made, offering features normally only available in professional full frame models. The 65-point AF system gives fast and responsive focusing in a wide range of conditions, even when tracking fast moving subjects. It can shoot at 10 frames per second, with a huge buffer even when shooting in Raw. The build quality is superb, with full weatherproofing that can cope with almost any conditions. Overall the 7D Mark II is perfect for sports, action and wildlife photographers who like to capture the most fleeting moments. The Canon EOS 5DS and 5DS R are the highest resolution full frame DSLRs on the market. The two models give photographers a choice: the EOS 5DS includes an optical low-pass filter to suppress digital imaging artefacts, while the EOS 5DS R cancels its effect for the sharpest possible images. The 50.6-million-pixel sensor, dual DIGIC 6 processors, reduced mirror vibration and reliable metering deliver superb image quality, while the 61-point AF with 41 cross-type points ensures reliable and fast AF performance. These two cameras are the perfect choice for professional photographers for whom ultimate image quality really matters. With the 11-24mm f/4L USM Canon’s engineers have constructed one of the best wide angle zooms ever made. The world’s widest rectilinear zoom provides class-leading image quality, with exceptional sharpness at all settings even on high resolution sensors. Distortion, chromatic aberration and vignetting are all kept reasonably low. Construction is superb, with weather sealing for outdoor use, and the autofocus is fast and silent. Full-frame users specialising in landscape, architectural or interior photography who demand exceptional optical performance need look no further. It’s bulky and expensive, but for those who can afford it, it’s an absolutely outstanding piece of glass. B&H carries the Canon EOS 5Ds/5Ds R, 7D Mark II and EF 11-24mm f/4L USM. LONDON, 13 July 2015 – Canon Europe will be demonstrating its end-to-end professional 4K workflow at IBC2015, the leading global tradeshow for media and broadcast professionals in Amsterdam, Netherlands. Canon, having exhibited at IBC for more than three decades, will showcase its first-class 4K range in its entirety for the first time in Europe – with 4K lenses, sensors and reference displays, all on show to demonstrate the company’s advanced glass-to-glass 4K workflow. The Canon stand will include dedicated areas for live capture, providing visitors with the opportunity to get hands on with Canon’s 4K and Full HD product range through a series of shooting scenarios, review and editing processes. A variety of live demonstrations including cinema shooting and documentary shooting will also be available to visitors. Canon’s Cinema EOS range has transformed the professional video industry since its introduction in 2011, with leading sensor technology, lens heritage and innovative product updates. In April 2015, the range expanded with the introduction of the next generation of 4K imaging devices, including the EOS C300 Mark II, a 4K video camera, and the DP-V2410, a lightweight and robust 24” 4K reference display. Both will be on display in Europe for the first time at IBC. At the show, broadcast and cinematography professionals will be able to get hands-on with Canon’s full range of 4K and Full HD products including the recently launched XC10 and the EOS C300 Mark II cameras, as well as having the opportunity to experience the full power of its optics portfolio. Industry professionals will also be able to experience the full power of the company’s optics portfolio with the opportunity to touch and try Canon’s extensive range of lenses, from broadcast to cinema and EF lenses. Canon’s IBC stand can be found at Hall 11, stand E50. LONDON, 27 May 2015 – Canon, a leader in imaging solutions, is sponsoring the ‘Hack the Visual’ 48-hour hackathon event, to engage with talent in London’s Tech City and support the creation of new digital imaging ideas and applications to enrich people’s lives. The event, organised by Imaging Mind – 26 to 28 June at IDEALondon – aims to bring together over 100 participants and challenge them to uncover the hidden possibilities of imaging and technology and bring new perspectives on visual culture. “Digital technology has transformed visual culture over the past couple of decades. With almost one trillion images forecast to be taken this year alone, we believe the way people will live with photos will be profoundly different in the future. We see a huge opportunity to innovate in this field by embracing today’s creative technologists,” says Alberto Spinelli, Director of Digital Services at Canon Europe. “Last month we acquired London based start-up Lifecake, accelerating the development of our digital consumer services proposition. The Hack the Visual event will help us to build relationships with more talent in this space that we can potentially help nurture and grow and pave the way to broadening our digital ecosystem,” Spinelli continued. “Anyone with a passion for visuals, regardless of whether that stems from a technology or an art perspective, is welcome. The best ideas are generated when teams come from a diverse mix of backgrounds and experience. We want people to embrace the true spirit of a hackathon, to share, collaborate, have fun and really run wild with their ideas." commented Floris van Eck, CEO, Imaging Mind. Canon will provide prizes at the event and will continue to look for opportunities to collaborate and further explore the winning concepts with the finalists. LONDON, 23 APRIL 2015 – Canon Europe today announces that it is acquiring London-based digital start-up Lifecake, marking a major step in the development of Canon’s digital consumer services business. This brings Canon closer to its ambition to play a part in every image taken no matter what device is being used, and enables the business to establish a presence within London’s ‘Tech City’. Lifecake is the company behind the Lifecake photo-sharing app for families, which allows parents to store, organise, share and relive key moments of their children’s lives. With Lifecake, parents can create photo and video timelines that the whole family can experience on smartphones, tablets, computers and in printed photobooks. Alberto Spinelli, Director of Digital Services at Canon Europe, says: “Today, we are all taking more photos on more devices than ever before but often become overwhelmed and even disconnected from them. We would all like to be able to quickly find our photo as we remember a moment – at the swipe of a finger – and relive it on any screen, or print it to hold. At Canon, we are building digital services to help people do just that with tailored experiences. Lifecake is currently available in English language worldwide. Today sees the launch of additional language versions in French, German, Spanish and Italian. 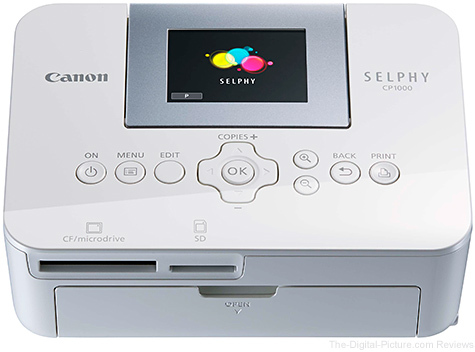 United Kingdom, Republic of Ireland, April 16, 2015 – Canon today unveils the SELPHY CP1000, a new compact photo printer that allows you to print creative, lab-quality photos at home and on the move. Capable of printing your favourite images in just 47 seconds¹ directly from your camera², USB or memory card, with the SELPHY CP1000 now every photo can be treasured. With an elegant, compact design, the SELPHY CP1000 includes 6.8 cm (2.7”) LCD tilting screen and combines an easy-to-use interface with exceptional print quality. Plus, with the inclusion of an optional battery pack accessory, the CP1000 is the ultimate portable photo printer. With ultra-high quality prints thanks to advanced dye sublimation technology, the SELPHY CP1000 produces high-resolution photos using 16.7 million colours. For even more clarity in prints the CP1000 also includes an Auto Image Optimize feature to further enhance blue skies and sunsets, correct colour cast and contrasts, as well as remove red-eye and noise. Plus, for picture-perfect selfies and group shots, the Smooth Skin mode removes facial imperfections to ensure you get stunning results every time. With the ability to control the heat applied to the ink ribbon on the print head, the SELPHY CP1000 offers four print finishes without ever having to use a different paper or media type. The options include a glossy finish for a durable print that will last up to 100 years, and three variations of semi-gloss for smudge and fingerprint resistant photos you can hand around. Whether you need a standard postcard sized image or a more unusual shape, such as a 50 x 50 Instagram style or a credit card sized print, the SELPHY CP1000 gives you the freedom to make your prints your own. The SELPHY CP1000 also allows for ID Photo Printing at 43 pre-set sizes, perfect for small offices or events where you need to print ID badges in a hurry. Plus, with the ability to print two different ID image sizes on one sheet, and ID framing and cutting guide improving accuracy and precision, every print counts with the minimum of waste. The SELPHY CP1000 will have an MSRP of £89.99/€109.99.